RefleXion Medical, a biotargeting oncology company using each cancer’s unique biology as a means to destroy it, will showcase its novel approach toward cancer radiotherapy at the upcoming American Society for Therapeutic Radiation Oncology (ASTRO) annual meeting in San Antonio, Oct. 21-24. The ASTRO meeting is widely considered the largest and most influential gathering of radiation oncologists in the world. "RefleXion’s presence at the ASTRO meeting is the culmination of a 10-year journey that began with a simple question: if a cancer cell emits a signal, can we shoot right back to destroy it?,” said RefleXion’s Founder and Chief Technology Officer, Sam Mazin, Ph.D. “Using biology to guide radiotherapy, we hope to have the means to turn cancer on itself." RefleXion’s biology-guided radiotherapy (BgRT)* is the first to utilize the cancer itself to guide radiation delivery, even in tumors that are moving. The machine uses positron emission tomography (PET), the gold standard in cancer staging and imaging, in a novel way. PET makes use of a small amount of a radioactive drug, called a tracer, to highlight the differences between healthy cells and cancer cells. The most commonly used tracer is FDG, a glucose-based compound, that BgRT uses to determine where the tumor is located. Cancer cells rapidly consume the FDG, which breaks down and instantly produces emissions, thereby signaling their location. Real-time response to these detected emissions is the fundamental principle of BgRT. Additionally, RefleXion will host a series of Office Hours in its booth, #1971, in Exhibit Hall C to allow peer-to-peer conversations with industry-leading RefleXion BgRT consortium sites from around the United States. Space is limited, so pre-registration is recommended. RefleXion’s platform enables a leap forward in the ongoing goal of conventional radiotherapy to manage motion, reduce tumor margins and diminish radiation toxicity, making it feasible to treat multiple tumors in the same session. Current radiotherapy systems require a margin of healthy tissue around the tumor to account for positional uncertainties such as involuntary patient movements and breathing. In many cases, this extra margin results in a significant amount of additional radiation delivered to the patient’s healthy tissue. If too much healthy tissue receives radiation and the patient nears threshold toxicity levels, less therapeutic radiation is available to ensure efficacy of treatment or to treat additional tumors. By using the tumor’s own emissions to guide radiation delivery, treatment margins and the subsequent radiation dose to healthy tissue may be significantly reduced. Traditionally PET is used to form a complete image that takes up to an hour, during which time the tumor can change location. However, as the FDG is consumed, the emissions it generates are instantly available and reveal the cancer’s location. The RefleXion platform senses these emissions and rapidly responds by sending a beamlet of radiation down the emissions’ pathways toward the originating tumor. By treating tumors that uptake the PET tracer, BgRT makes it feasible to track and treat multiple tumors throughout the body in the same session, a game-changing advance over existing platforms. RefleXion Medical is a privately-held pre-commercial company developing the first biology-guided radiotherapy (BgRT) system that will drive a new paradigm in cancer care. 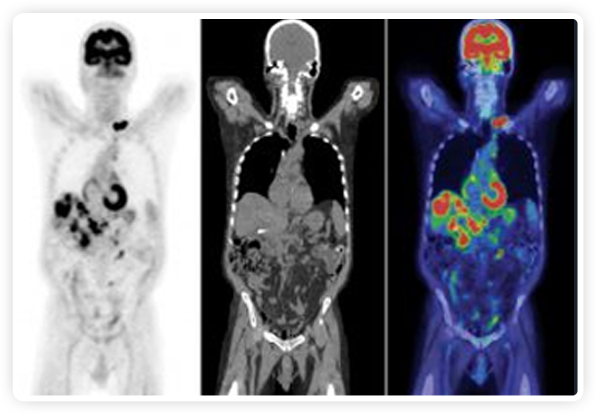 By leveraging positron emission tomography (PET) in a novel way, RefleXion’s patented technology will allow multiple tumors to continuously signal their location during treatment, even during motion. The RefleXion system also improves upon the delivery of conventional radiotherapy for single-site cancers. RefleXion is backed by premier investment firms firms TPG Growth/The Rise Fund, Sofinnova Partners, KCK Group, Venrock, T. Rowe Price Associates, Inc., China-focused healthcare investment firm GT Healthcare Capital Partners, and global pharmaceutical leaders Pfizer Venture Investments and Johnson & Johnson Innovation, JJDC Inc. The company has also received grant funding from the National Cancer Institute (NCI) Small Business Innovation Research (SBIR) Program and a passive, minority investment from UPMC. *The RefleXion System requires 510(k) clearance and is not yet commercially available in the United States. ASTRO '18: RefleXion to unveil new approach to cancer treatment . Appl Rad Oncol.